Updated for game version 1.31! For those of you asking for compatibility with GILL I can't fix this issue. I don't really understand GILL's implementation (novice programmer) so please talk to other mod authors regarding this problem. Sorry! If you can't launch the game after installing this mod, and in the error list you can't find the mod name mentioned anywhere, please verify your game files. A lot of people get problems due to issues when their game has been patched incorrectly for whatever reason. The method to verify your game files varies depends on whether you use Steam or GOG, use google to get instructions if you don't know how to do it. If after that you are still having problems post here. Can someone confirm this now works 100% with 1.12? Or should I wait til the next DLC with patch comes out in a few weeks? For everyone's attention: the game considers Arachnomorphs from the Hearts of Stone expansion to be Specters. I have theories on why this happens, but what's important is that if you're fighting Arachnomorphs and see that Specter oil has been applied, don't worry that oil type is correct. Oh no s***? I thought this was a bug! It makes sense though, especially considering the spiders you fight at the Olgierd estate. This is compatible with 'Oils Never Expire' from @goatofdeath ? Does this mod also re-apply oils? Don't know if I should use Fixative or not.. So I'm not entirely sure if it's allowed or not, but I love this mod but I love preparations as well, so I sucked it up and learned Witcher Script. I was able to make it so if a monster's type of oil was already applied, it would not reapply. 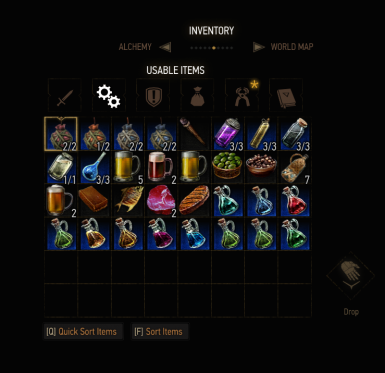 Unfortunately, i was not able to do an ammo count as I did not know how to do that due to this being my first attempt at modding or scripting the Witcher. For those who are curious or wish to apply this for their game, copy and paste the code below, and replace the existing AutoApplyOils function with this. The file needing to be modded can be found at \\%Path to Witcher Directory%\mods\modAutoApplyOils\content\scripts\game\mod\AutoApplyOilsFunctions.ws\ . For some reason notifications didn't work so I had to do a straight GuiManager notification, so in the end, they still do work, they just aren't as fancy. I have not had a single bug yet, and I used the regular method for initial installation. Tried to use your changes however I just get an error upon launching the game and compiling the script. Not sure if I'm meant to replace the whole AutoApplyOilsFunctions.ws text or only part of it. I spent half an hour trying to fix this then right after I commented I managed to fix the issue. So disregard this message. Sorry should have been more clear. Within AutoApplyOilsFunctions.ws , there is a function called AutoApplyOils. Find this function and replace the entire function with the one provided, you have to manually edit the existing AutoApplyOilsFunctions.ws. So do not replace the file itself. Thank you. I wanted something more hands on, but after a couple hours of frustrating hours looking through readmes that read like tech manuals and screwing around with Friendly HUD trying to get it to work, this will due just fine. How do I disable this mod? I like it very much, but I want to do the achievement where you complete two witcher contracts without using anything like oils or bombs. However, when I remove the folder modautoapplyoils from the mods folder, it still auto applies oils in the game. I have the same issue - I've uninstalled the mod and the flashing effect and red glow on Geralt is still apparent during combat. I've deleted the mod from Mods folder also. Does anyone know the location of the actual modified files so I could possibly delete them and then re-verify files to rebuild via Gog? Does preparations make this mod not function properly? As preparations will not allow you to apply oils while in battle. Warning [content0]engine\environment.ws(30): Global native function 'EnableDebugOverlayFilter' was not exported from C++ code. Warning [content0]engine\environment.ws(32): Global native function 'EnableDebugPostProcess' was not exported from C++ code. Warning [content0]engine\showflags.ws(11): Global native function 'DebugSetEShowFlag' was not exported from C++ code. I'm replaying the Witcher 3 again in 2018 (almost 2019) and I must say, this is one of the most useful mods I have. Definitely endorsed. It doesn't seems working, it's not compatible with the 1.32?